Laksa (or curry laksa), originally a Peranakan dish, has managed to capture the hearts and stomachs of both Singaporeans and Malaysians. There are three main variations of laksa: curry laksa, assam laksa and Sarawak laksa. Curry laksa is predominant in Singapore, seeing as to how all the well-known stalls serve this variant. You can still find the other types too, albeit in lesser numbers. To me, the selling point of a good laksa would be its gravy – cooked with shrimp paste, coconut milk and cockles. 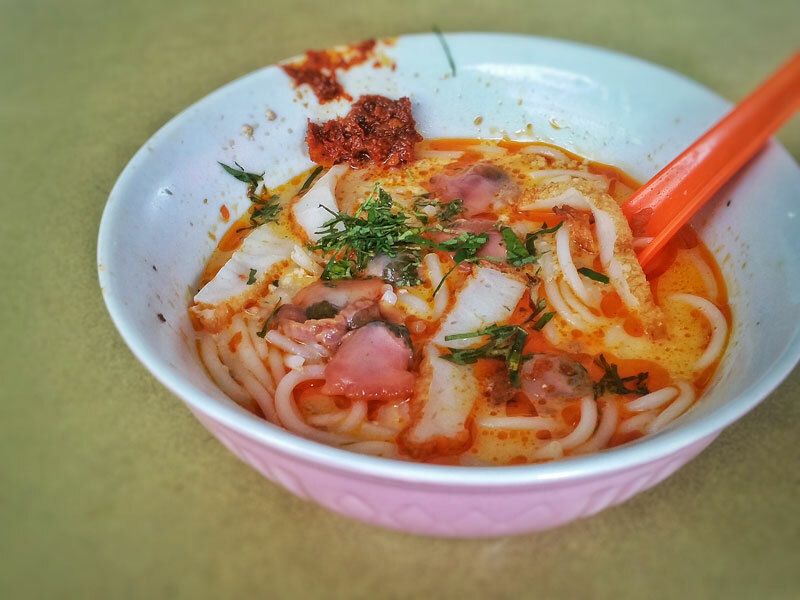 While we all are familiar with the Katong Laksas which have been fighting for the title of ‘Best Laksa in Singapore’, there are other stalls in Singapore which are still highly popular. So, without further ado, I present to you my favorite 10 of the best Laksas in Singapore that you’ll find irresistibly yummy. I was impressed with 363 Katong Laksa’s efficient ordering system. With four Ipads placed right in front of their stalls, you no linger have to worry about waiters getting your orders wrong when they’re overwhelmed with customers! The price of additional ingredients are also indicated clearly, so if you’re someone who loves cockles, you’ll be pleased to hear that you can add as many additional servings of cockles as you like – as long as you’re willing to pay, of course. My bowl of piping hot, aromatic laksa came promptly and I dug in right away. At $4, I felt that the serving size was reasonable. Their gravy is a lot richer and thicker than many of the laksas I have tasted before so that was rather interesting. Rather than tasting strongly of coconut milk, 363 Katong Laksa’s gravy emphasised the shrimp paste flavour more. Therefore, it was more savoury and scrumptious. The prawns also tasted very fresh and the meat gave way immediately once bitten into. Yum. Also, I loved that the vermicelli was cooked al dente, rather than too mushy; which is the norm for many laksa stalls. I found that I enjoyed 363 Katong Laksa a lot more than other laksas but then again, it all comes down to personal preferences. If I ever had to choose my favourite laksa in Singapore, this would be it. Roxy Laksa is special and unique in the sense that they do not offer cockles in their laksas. Rather, they make up for it with a more generous serving of prawns. The stall’s coconut milk is also squeezed freshly every day, explaining why the gravy just tastes so good. Customers have remarked that the gravy is lighter and is seen to be ‘healthier’ in comparison to Roxy Laksa’s competitors. 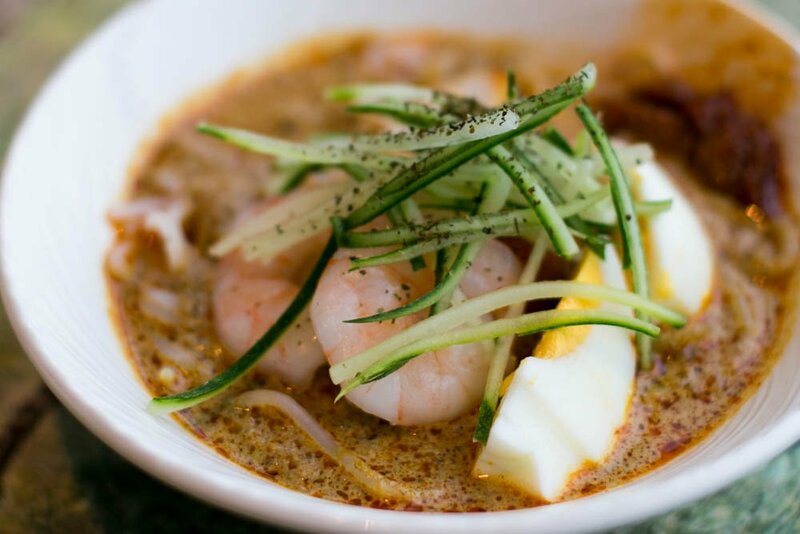 For those who are health-conscious, Roxy Laksa will no doubt capture your heart and stomach. Just like all other Katong stalls, Roxy Laksa’s smallest bowl costs $4. There’s nothing to compare price-wise here. Janggut Laksa calls themselves ‘The Original Katong Laksa’. I’m not too sure about the true origins since many stalls in Katong all claim a different story – it is still true that many Singaporeans and tourists alike flock to the stall for a quick laksa fix. While I was there, I also noticed that their chicken curry was really well-received; alongside their all time favourite laksa. Janggut Laksa’s gravy was not as thick but still managed to pack lots of flavour within itself. I also noticed that it was rather oily – all of that chilli oil goodness perhaps? I had one small gripe with their laksa, which was the exceedingly small portion I got in return for $4. The laksa was delectable and scrumptious, yes but value for money, perhaps not. Still, I did wolf down the entire bowl and felt quite satisfied because it was still delicious. Yes, this is the famous 328 Katong Laksa which beat Gordon Ramsay at the SingTel Hawker Heroes Challenge which took place at Newton Food Centre. 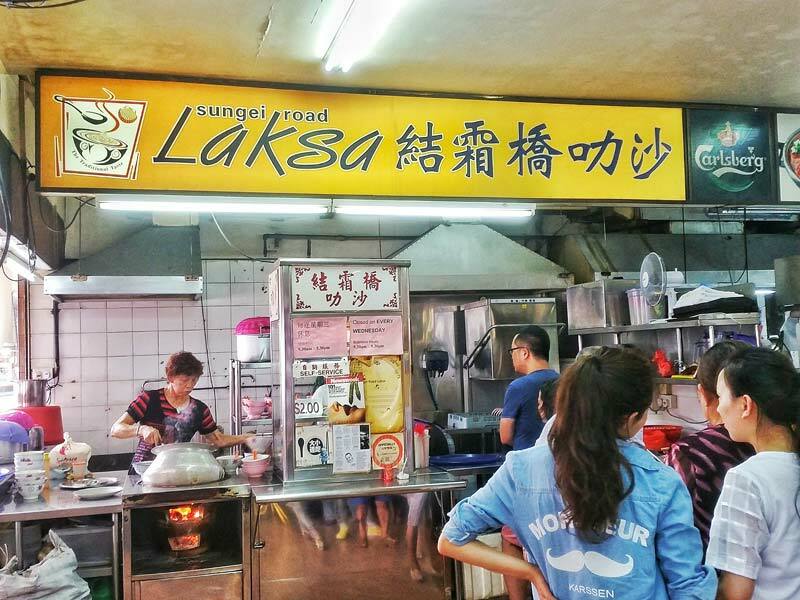 Ever since then, 328 Katong Laksa has been calling themselves the ‘No. 1 Laksa in Singapore’. It is well known for having noodles that are cut into shorter strands and only require a spoon to eat. I won’t lie; I did feel a little cheated when my bowl of laksa came. There was a great disparity between what was pictured in their banner and what was presented to me. At $4.50, I wasn’t sure if the bowl of laksa would live up to the hype. But I still carried on anyway, since I had already paid and was on a personal mission to find Singapore’s real best laksa. Before ordering, the staff would ask if you would like chilli. If you cannot take spicy food, I would advise for you to skip the chilli. This is because rather than serving it separately, they place the chilli paste in your spoon so you have no choice but to stir it all into your bowl of laksa. The coconut milk taste was really strong; counterbalanced by the spiciness of the chilli, making the gravy was rich with flavour. Their prawns were rather crisp and tasted fresh. I could definitely tell why 328 Katong Laksa has such a huge following of loyal fans. Also, the serving at Katong Laksa is also one of the more generous ones. I could barely finish my share so if you have a large appetite and are dealing with some laksa cravings right now, 328 Katong Laksa is the place to go. A bowl of Sungei Road Laksa will only set you back by $2 $3 (priced increased since next gen took over). The taste and quality of laksa served is not compromised in any way by their low price point; in fact, as loyal customers would be quick to tell you, Sungei Road Laksa’s gravy is phenomenal. The secret behind their gravy is that the store owner still insist on cooking the gravy over a charcoal burner. How many stores in Singapore still employs charcoal to cook their food? Apparently, charcoal lends a smokey and slightly charred taste to the gravy, causing it to be so good. *A recent revisit though found the gravy to be thinner and lacking in the charcoal flavour – an expected drop in standard due to overwhelming queues from its popularity. Right off the bat, you can tell that Depot Road Zhen Shan Mei’s gravy is a lot thicker than most laksas’. It reminds me curry mee. Served in a claypot, the laksa retains its heat well. Which means that you have plenty of time to relish the smooth and thick laksa gravy without it cooling down and losing flavour. Perfect for that catch up session with your old time friends! Right off the bat, you can tell that Depot Road Zhen Shan Mei’s gravy is a lot thicker than most laksas’. It reminds me of curry mee. Served in a claypot, the laksa retains its heat well. Which means that you have plenty of time to relish the smooth and thick laksa gravy without it cooling down and losing flavour. Perfect for that catch up session with your old time friends! There have been complaints that the portions are rather small so do keep that in mind when patronising the stall – order bigger sizes if you are someone who has a ravenous appetite. For the others, however, stick to the smaller versions because the gravy does get a little heavy and jelat (sick) as you get to the end of your bowl. Relatively less well-known than the other numerically-named Katong chains, Terry Katong Laksa is located right in the middle of Bukit Timah Food Center. The servings are pretty generous for the $3.50 you fork out. Not that the price point comes anywhere close to Sungei Road Laksa but at $3.50 it is still pretty affordable. The gravy is a lot lighter on the coconut milk and there isn’t a strong, robust taste of shrimps. I didn’t particularly fancy it but my fellow companions slurped the gravy all up to its very last drop. Each to their own preferences, I guess. Another stall with three numbers in front. I’m starting to wonder if these numbers mean anything. Okay, after some ahem, research (Google is my best friend) that this stall used to be simply called “Laksa” but due to its popularity, customers named it after the block of HDB – 928 it was situated in for easy reference. Named the ‘best laksa in Yishun’, it’s been said that the gravy goes down light but is savoury and full of flavour. Rather than the usual ingredients of laksa like prawns, 928 Yishun laksa is unique because their bowl is topped up with elements which remind me of Yong Tau Foo. Just look at those bright, cheery and welcoming pieces of crab stick. Need I say more? This isn’t a stall per se, rather it is laksa from a buffet line from Seasonal Tastes. I know, I know. I can hear you grumbling from here. It might be a little troublesome and pricey to make a trip down to Westin Hotel’s Seasonal Tastes just to get to the laksa. But you have to believe me, on my very first mouthful of this laksa, I fell in love. I didn’t expect laksa from a buffet line to be of this high quality. Not only was the presentation pretty, the ingredients used for the laksa were also extremely fresh. The gravy was not overpowered by the coconut milk taste and it was balanced well with the savoury shrimp paste. The prawns were firm but once bitten into, it felt like the meat simply dissolved away in the mouth. Mmm. The chef in charge of the laksa gravy specialises in laksa, so you can rest assured that it will be more than satisfactory. 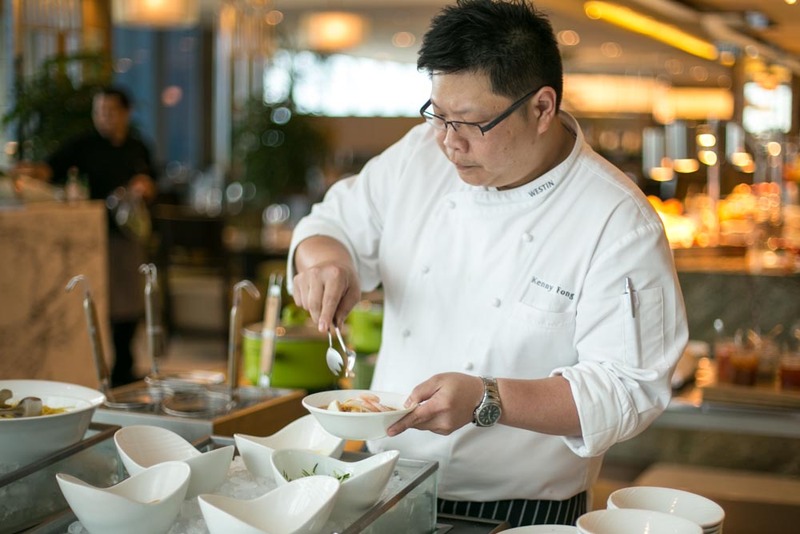 After having had your fill of Seasonal Tastes’ laksa, you can move on to attacking the other dishes in the buffet too! Different from the usual Katong style laksa, the gravy of Penang Assam laksa ($8.30) is sour yet spicy. It is termed as ‘Assam’ due to the addition of tamarind into the fish broth. I can imagine this dish to be a great remedy for blocked noses – just a few sips of this and you air passages will just clear up! The Penang Assam Laksa at Penang Kitchen has been described to hit all the right spots, being pungent, hot, spicy and sour all at the same time. It sounds like there is a lot going on taste-wise but many people have remarked that the tastes come together well. Well, I’m sold.